Rigamajig building kit | Creative Play products | KaBOOM! 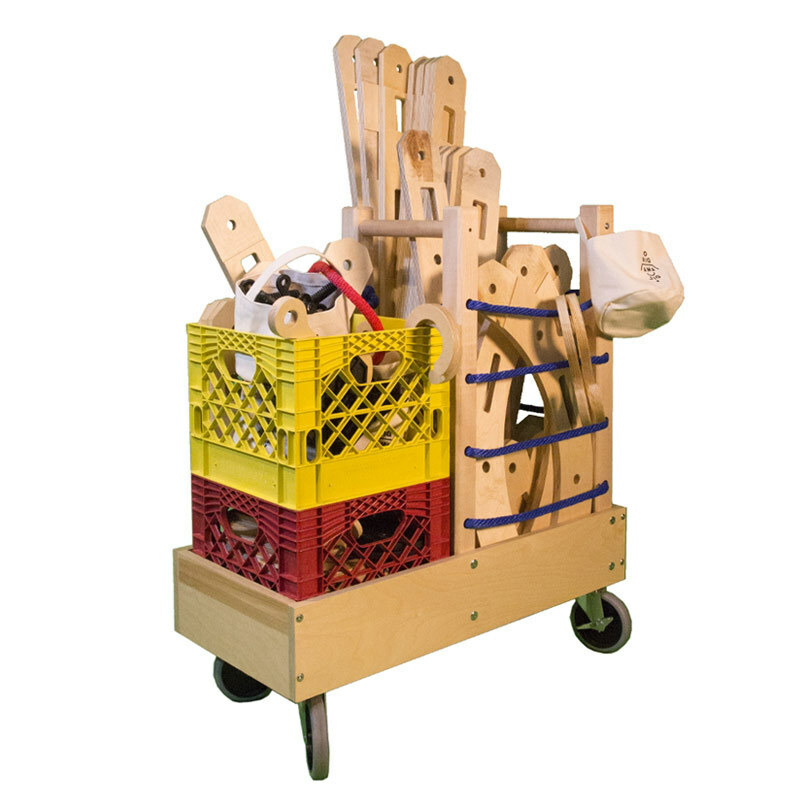 A new large-scale building kit used for hands-on free play and playful STE(A)M learning. This collection of wooden planks, wheels, pulleys, nuts, bolts and rope allows children to follow their curiosity through play. Engaging the inquisitive mind and creative spirit, Rigamajig empowers children to think in three dimensions, building things larger than themselves. Rigamajig Basic Builder is ideal for classrooms, children's museums and groups of children learning and playing collaboratively. The solid wood 3/4" thick planks range from 12"-44", allowing children to build things larger than themselves. Children often say "this isn't a toy, this is real!" as they familiarize themselves with the scale and weight of working with wood. All the while they are cooperating and communicating to problem solve, pretend and play. Buy Rigamajig today! 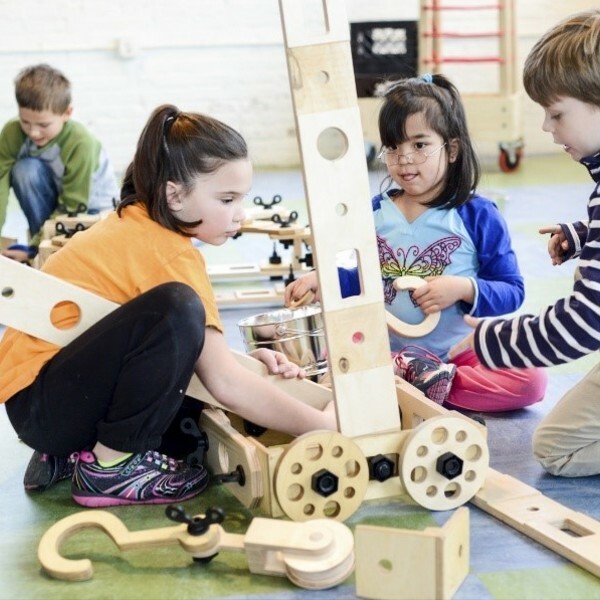 Rigamajig creates playful, cooperative learning communities, through means of collaborative building and child-directed play.The kit enables easily accessible, cognitively challenging play opportunities for children of any age in any environment. 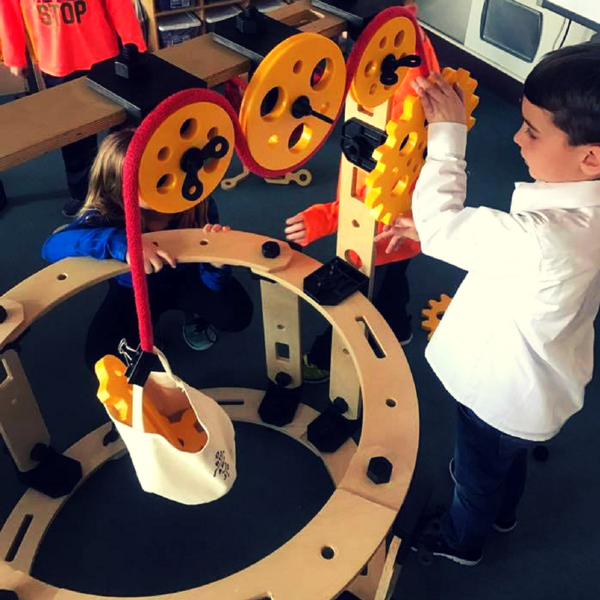 Rigamajig fits with principles of STEM and STEAM education, which promote focus on science, technology, engineering, math, and art through hands-on, inquiry-based learning to provide children opportunities for creativity, innovation, collaboration, and critical thinking. 260+ wooden planks, wheels, pulleys, nuts, bolts and rope. 260+ parts total; Made in the U.S. Plastic parts are made from 100% recycled nylon. Wood parts are made from the highest grade Baltic birch plywood and finished with a non-hazardous, air-pollutant-free finish. Cart with contents weighs approximately 149 lbs. Store your Rigamajig with this zippered canvas cover. 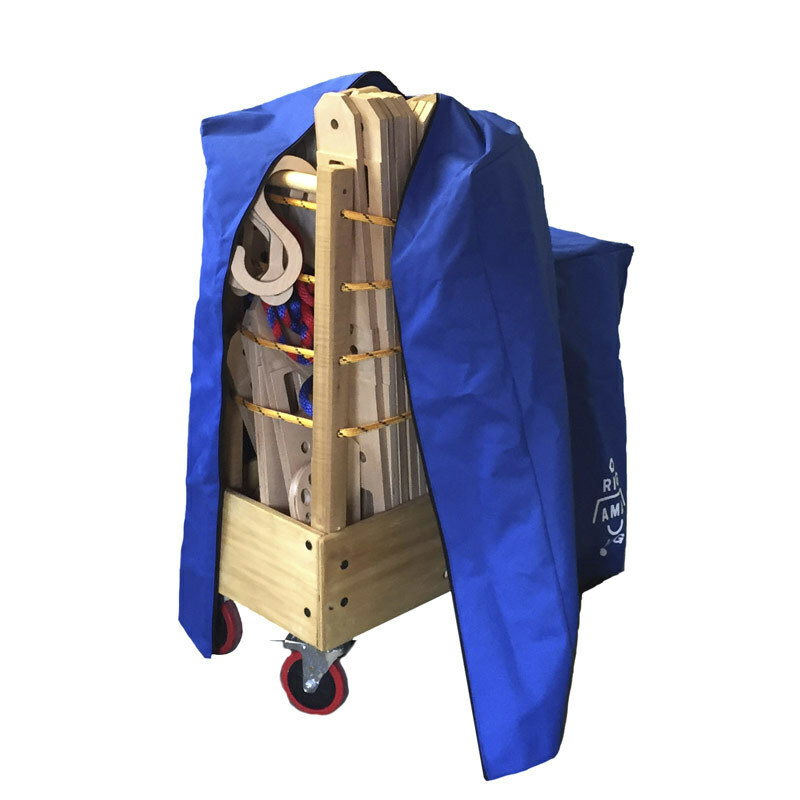 Made of blue canvas with a zipper for easy on and off, this cart cover helps give Rigamajig storage a clean and finished look while also keeping young hands and eyes focused on the next task or activity in your space. MADE IN THE U.S.A.
Stashed in a duffle bag, 160 parts designed for home use. Perfect for playing with on the living or bedroom floor, backyard or even in the back seat, its handy carrying duffel bag makes it easy to put away and bring anywhere. Half-inch thick Baltic birch planks range from 6"-22", making it large enough to make things to play inside of, but small and light enough to play in a lap or table top. 160 parts total, Rigamajig Junior is designed for home use. Manufactured in Vietnam of highest quality Baltic birch and finished by hand. 78 STE(A)M-friendly parts to expand the Basic Builder Kit. 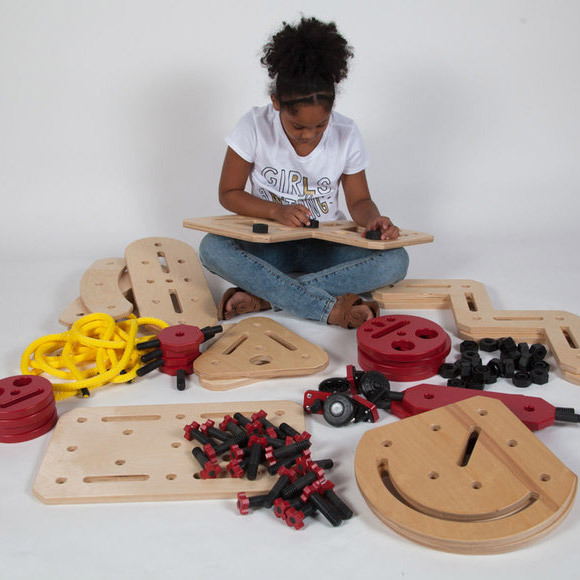 Rigamajig Simple Machines Add-On Kit is a brand new set of Rigamajig components to expand Rigamajig Basic Builder Kit, the large-scale building kit conceived for hands-on play and STE(A)M learning! 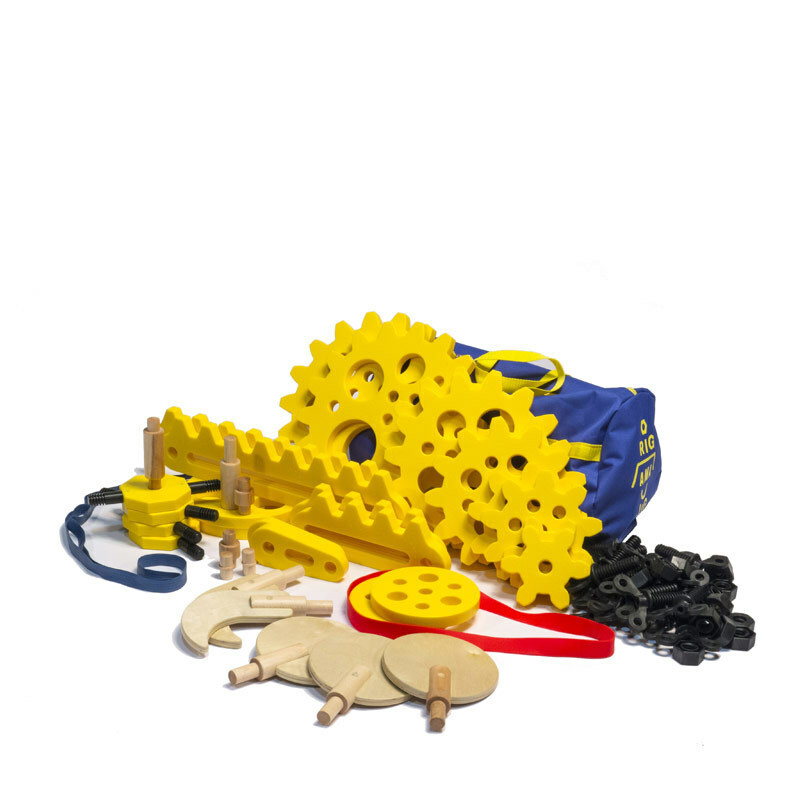 Simple Machines Add-on Kit includes gears, a new wheel-pulley, levers, belts, cranks, and axles! These thoughtfully crafted loose-parts were created with educators' feedback in mind with the goal to provide a new perspective and range of discovery, tinkering and exploration inside a classroom, on a playground, or in any play space. Now, young collaborators can mechanize their Rigamajigs, making simple or complex systems that exemplify the principles of mechanics, direction and force. 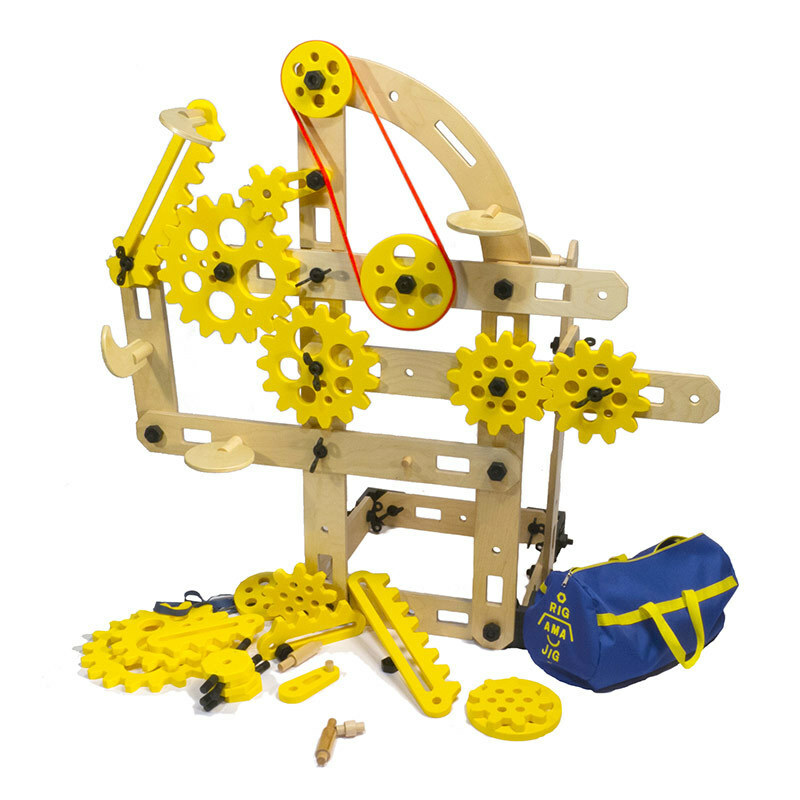 Similar to Rigamajig Basic Builder Kit, the Simple Machines Add-on Kit lends itself not just to structures or machines, but also all kinds of sculptural creations! 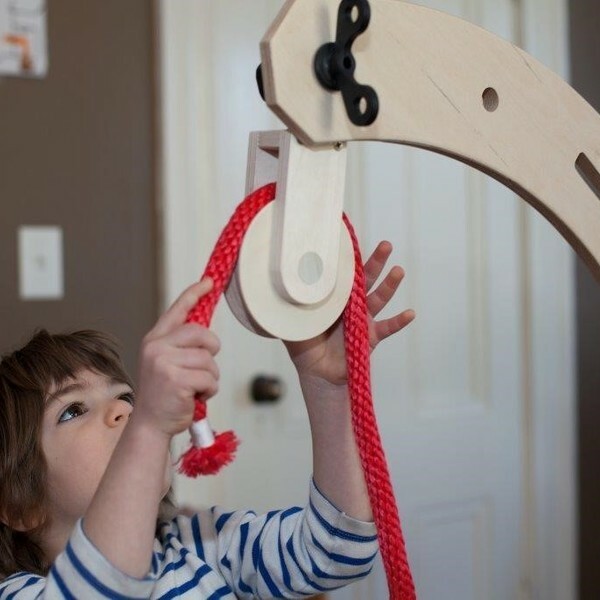 Same as the Rigamajig Basic Builder Kit, the Simple Machine's Add-On Kit is made and manufactured in the United States. It is fabricated using the highest grade Baltic Birch Plywood and finished with a HAPS-free (Hazardous Air Pollutant-free) finish, and the Wingbolts, Hexnuts, and Brackets are made from a reinforced 100% recycled nylon. Experiment with cause and effect, gravity and systems. 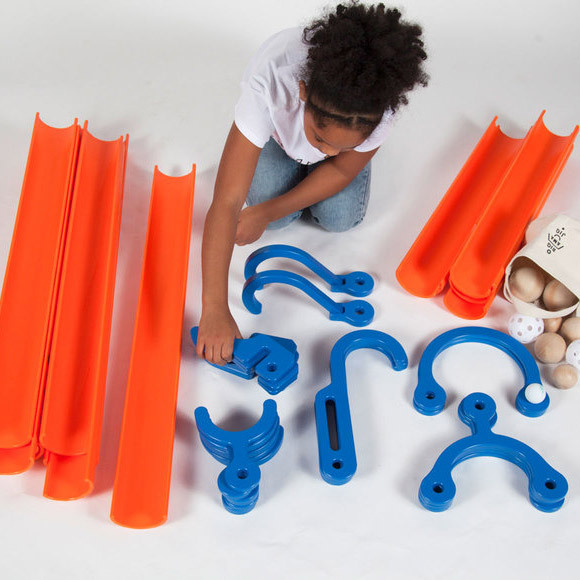 Experiment with cause and effect, gravity, and systems thinking by transforming your Rigamajig Basic Builder into a system of chutes and ramps. We've designed cradles and hooks that attach to Rigamajig planks in multiple ways and support two lengths of extruded plastic chutes. Young builders can test their contraptions with the balls of assorted materials and sizes included with the kit, or with marbles, wheels, water or anything else they can imagine. The exciting process of planning, collaborating and building a ball run may become your favorite Rigamajig project! Make rolling, spinning and mobile locomotion contraptions. Expand your Rigamajig Basic Builder to make rolling, spinning, mobile contraptions. 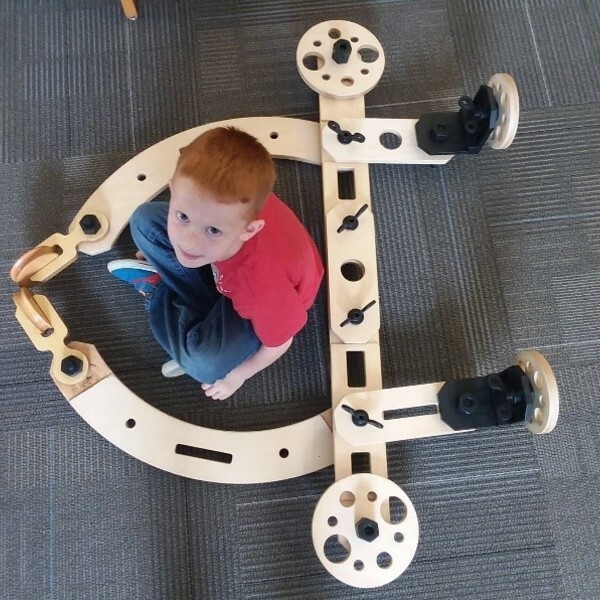 We designed 8 wheels with patterns and silly faces that can be fastened to planks or platforms in multiple ways. Axles and axle bolts allow wheels, propellers, pinwheels, and much more to spin freely. Swivel casters provide projects with an immensely versatile range of motion. We've made sure to include enough hex-nuts to secure them all, and with eight long lengths of our soft, easy-untie rope you'll always have enough at hand to pull, fasten, or practice knots. There are 2 new types of wooden planks: a zig-zag adds new possibilities for angles and height and a 60 degree curve affords curvilinear forms. And, for the first time we have four distinct platform shapes to use horizontally, vertically, and everything in between. Kit includes 2 storage bags. Locomotion Add-On Kit must be used with Rigamajig Basic Builder and is not compatible with Rigamajig Jr. Conceived and designed as a custom play feature for the High Line Park in New York City, Rigamajig was developed by Cas Holman for Friends of the High Line in collaboration with early learning educators, woodworkers, and children. It was launched in 2011 as the High Line Children's Workyard Kit and reflects the High Line's industrial history, simple and honest materiality, and the organization's dedication to creating meaningful play opportunities for children and families. Since its debut, Rigamajig has found its way into numerous schools, playgrounds, children's museums, and backyards. The award-winning design is evolving and expanding as we learn from our pilot schools and playful friends. Cas Holman continues to design and advocate for play, imaginative making, and art education. Her ongoing relationships with visionary schools, teachers, and children's museums give her opportunities to observe and learn from experts in childhood and play. She is a Professor of Industrial Design at the Rhode Island School of Design (RISD) and is constantly discovering connections between design education, early childhood, and play. Heroes Will Rise was founded by Cas Holman in 2006 to support well designed, imagination-centric toys. In an effort to maintain a high standard of quality and design, (and because few things are more fun than a factory tour) the company manages the manufacturing of all of its products.